Madelaine Stoen could have moved on to living the carefree life of a typical 9-year-old after a long and courageous battle with rhabdomyosarcoma. But that, we've discovered, simply isn't her style. As you may recall, Madelaine gained some unexpected fame and good fortune after Oprah Winfrey and Simon Cowell caught wind of her story. Madelaine was fighting a "rare and aggressive cancerous tumor of the muscles." As the Stoens shared their story on Oprah's show, Cowell walked on stage and handed the family a personal check for the balance of their home mortgage so Amy and Randy Stoen could worry less about money and focus on taking care of Madelaine. In turn, young Madelaine found her own ways to give back. She donated 10 inches of her own hair to a local Locks of Love cancer benefit and began making and selling bracelets to help raise money for cancer research. The Rochester Post-Bulletin and KAAL-TV report that young Madelaine continues her giving ways, recently spearheading a fundraiser at her Blooming Prairie (Minnesota) Elementary School to help buy books for patients at Mayo Clinic Children's Center, where she spent so much time. 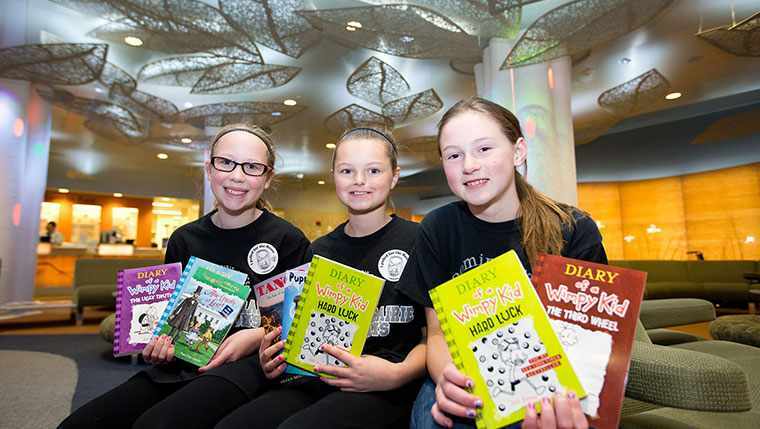 "I wanted to give back to the Mayo Clinic so they don't run out of books," she tells the P-B. Amy Stoen, tells KAAL-TV that Madelaine wants other kids to experience the same kind of mental break and distraction that the books (handed out by Mayo volunteers) gave to her. "Every time we come up here she gets a book, and it's awesome, because that would take her mind off of what was coming next -- going through the corridor, seeing the doctor, hearing the news," Amy says. "She would concentrate on her book." To raise money for the books, the P-B reports, the school's staff "put out buckets for loose change" with the words "Madelaine's Mission" on them. That loose change piled up to more than $1,000 -- enough to buy 230 new books for the Children's Center. One of Madelaine's friends made more than 300 bookmarks to go with them. Amy Stoen tells the P-B the whole school pitched in. "It's wonderful that these kids are giving back to kids that they don't even know," she says. "And it's the Mayo Clinic. Who knows how many kids come from all over the world, all over the United States? These kids are making a huge impact in the United States, in the world." You can reach us right here on the In the Loop blog by taking a moment to share your comments and share this story with others.